In the city of Chicago, 47 percent of black males between the ages of 20 and 24 are out of work and out of school. This is just one of the many disturbing numbers that can be found in the Great Cities Institute report released today at the Chicago Urban League by the Alternative Schools Network. In a hearing before elected officials, UIC’s Great Cities provided highlights of the report entitled, Lost: The Crisis of Jobless and Out of School Teens and Young Adults in Chicago, Illinois, and the U.S.
Teresa Córdova, GCI Director, made the point that for young people of color, especially young Blacks, conditions of joblessness are Chronic, Concentrated and Comparatively worse (comparing to Illinois, U.S. Los Angeles and New York). Looking at data from 2005 to 2014, low rates of employment and high rates of joblessness have persisted over time. Furthermore, “The low rates of employment are spatially concentrated in neighborhoods that are also racially segregated” (19). This report highlight that youth employment rates are tied to conditions in neighborhoods and cannot be seen as distinct from what is happening in the neighborhoods themselves. The devastation of unemployment in turn, wreaks havoc on the neighborhood (19). Where the “permanent scars” lead to conditions that are both a consequence and a precipitating factor that leads to further youth unemployment and parallel social conditions (19). …Where feelings of low self-esteem, depression, and powerlessness are often accompanied by substance abuse and in many cases, violence and crime (19). 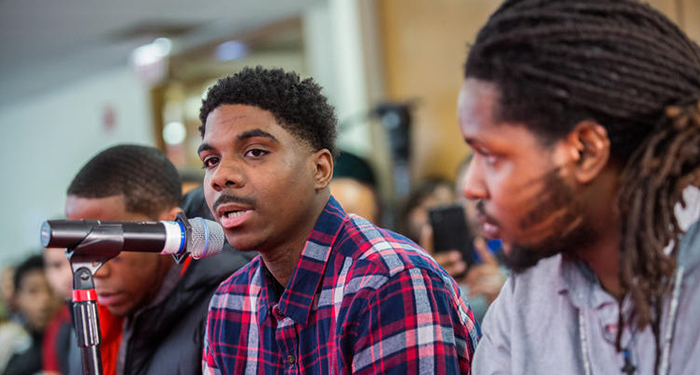 One young black man said, “I’m not asking for sympathy, it’s just my reality.” But in all the stories of their realities, these young people also spoke of wanting a future, not wanting to be a statistic, and having dreams for a better life. Chicago is a great city. But how can it truly be great when this “tale of two cities,” provides such a stark comparison in the employment opportunities among young people. This report [and the voices of the young people themselves] reminds us of the urgency to address these issues of chronic and concentrated conditions of limited employment opportunities that not only affects the young people themselves, but their families, households, and neighborhoods. The reverberations surely extend to all aspects of our society. I attended the event and appreciated the use of maps to show where this problem is most concentrated, as well as how poverty, unemployment, poorly performing schools and violence are related. I posted my own comments at http://tutormentor.blogspot.com/2016/01/engaging-volunteer-mentors-in-youth.html and have been sharing ideas using maps for nearly 20 years. The articles I’ve been sharing on the blog since 2005 and in printed newsletters since 1993 focus on using maps and available information in on-going marketing efforts that help every high poverty neighborhoods have a birth to work pipeline of age appropriate programs that provide a wide range of support and serve as a bridge connecting people from beyond poverty, including business, so that more people are personally and deeply involved in long-term solutions. I look forward to connecting with others who are also looking at deeper, map-bases solutions intended to build and sustain the public will needed for any solution.